The Cenos beings apparently are from the Proxima Centauri star system 12,000 to 13,000 AU away from Alpha Centauri's A and B stars.... Proxima Centauri is about 0.1% solar mass. Any planet in the habitable zone would always keep the same face pointed towards its Sun, Proxima Centauri. Therefore, that face would always be illuminated. This is consistent with the report that the 'Cenos sky always lit-up'. "Did we find a terrestrial planet? We don’t know for sure. The planet’s MINIMUM mass is 1.3 Earths because we don’t really know the orientation of the orbital plane with respect to the observer. (The radial-velocity method provides a measurement of m sin i, with i being the inclination of the system with respect to us.) Assuming random orientations of orbital planes, we have a 90% probability that the true mass is less than 2.3 times the minimum mass, so 3 Earths. In short, this could be a super-Earth or something more exotic, like a baby-Neptune"
"Taiwan UFOlogy Society (TUFOS) on Saturday announced a transparent alien creature was photographed by a police officer near Jiaming Lake, located at an altitude of 3310 meters, in the southern part of the Central Highlands in Taitung. The above photograph shows a large alien creature seen from a distance. Due to its odd shape, TUFOS certain, it's not human, but a creature from outer space. Chairman TUFOS, Huang Chao-ming revealed, the photo was taken by a police officer with his iPhone 4." Experts at the Taiwan Unidentified Flying Object Society (TUFOS) measured the 'alien' to be approximately 8.2 feet tall. The 'alien' had webbed hands, nearly completely transparent skin and his head was quite similar to the head of a praying mantis. TUFOS experts concluded that the alien being had come from an underground alien base in the vicinity of the lake. Since Proxima b keeps one side facing its Sun, the other side must be cold and covered with ice like, Antarctica. Earth's Antarctica is a secure place similar to the back side of their planet that only indirectly feels the warmth of their Sun. Earth's Antarctica offers a place where the Cenos Aliens can have as a base and not experience much harassment by human interference. Tidally locked planets could be more common than Earth-like planets! And these "eyeball planets" might even be a promising place to look for unique lifeforms! 00:34 "Because of how they orbit, they would have all their ice on one side and all their deserts on the other "
The purpose of this web page is to keep track of other relevant web pages about the Earth's Antarctic region where this ET alien base may exist. The tweet comes days after the U.S. astronaut was mysteriously taken ill in Antarctica and had to be evacuated to safety in nearby New Zealand for emergency medical treatment. Kerry was the highest ranking US government official ever to visit the South Pole, and his visit struck many as unusual. Few saw any purpose whatsoever to sending America’s top Diplomat to the farthest reaches of the earth to see . . . ice. For Today in Conspiracy Corner we travel all the way to Antarctica. That is where the 2nd man on the moon (official story)- iconic Apollo 11 astronaut Buzz Aldrin sent out a cryptic Tweet he then later deleted. The Tweet featured a picture of a mysterious pyramid and the caption "We are all in danger. It is evil itself." For medical reasons Aldrin had been evacuated from the South Pole on December 1st where he was visiting as part of a tourist group. The American hero was air lifted to New Zealand with fluid in his lungs, but soon recovered with antibiotics and rest. At least according to the official story. The strange Tweet opens up fresh questions about his REAL reason for going to Antarctica at the age of 86 and what exact illness he may have contracted from whatever he encountered down there. SVR analysts in this report note that Secretary Kerry’s attempt to persuade the "guardians" to interfere in a "temporal matter" was "quickly/immediately" rebuffed by these "entities" who then ordered him to leave the "barrier zone" and not to return. An amazing (but nearly 90% censored) Foreign Intelligence Service (SVR) report circulating in the Kremlin today states that the Antarctica “guardians” swiftly retaliated against the United States this past week by "creating/unleashing" a massive earthquake after the Obama regime sent “without invitation or permission” its Secretary of State John Kerry to initiate contact with them in the “barrier zone” that’s forbidden by all "known protocols" in dealing with these "entities". Wilcock says he is in contact with "at least two insiders who directly advise Presidents of the United States" who have been steadily feeding him "Cosmic Top Secret" information for many years. He claimed that this information is not revealed to Presidents because they could slip up or be forced to tell the public what they know. He believes that there is a global power struggle going on that has reached a critical stage and made many elites start to scramble for safety. To what spurred this astonishing mission, this report explains, was the contacting on 25 September of His Holiness Patriarch Kirill of Moscow by representatives of the Custodian of the Two Holy Mosques in Mecca, Saudi Arabia, regarding a mysterious ancient "device/weapon" discovered under the Masjid al- Haram Mosque (Grand Mosque) during what has turned into a very controversial construction project begun in 2014. Gravely raising the concerns of the Grand Mosque emissaries, this report continues, was when this mysterious "device/weapon" was discovered on 12 September by a 15-man tunnel digging crew-and who in their attempting to remove it were instantly killed by a massive "plasma emission" so powerful it ejected from the ground toppling a construction crane killing, at least, another 107 people. Catastrophically worse, this report notes, was that barely a fortnight after the first attempt to remove this mysterious 'device/weapon' was made on 12 September, another attempt was made on 24 September which killed over 4,000 due to another massive "plasma emission" which put tens-of-thousands in panic -but which Saudi officials then blamed on a stampede. As to the contents of this ancient Islamic manuscript, "Gabriel's Instructions To Muhammad", this report briefly notes, it centers around a group of instructions given to Muhammad by the Angel Gabriel in a cave called Hira, located on the mountain called Jabal an-Nour, near Mecca, wherein this heavenly being entrusted into Muhammad's care a "box/ark" of "immense power" he was forbidden to use as it belonged to God only and was, instead, to be buried in a shrine at the "place of worship the Angels used before the creation of man" until its future uncovering in the days of Yawm al-Qmah, or Qiymah, which means literally "Day of the Resurrection". Almost three miles of ice buries most of Antarctica, cloaking a continent half again as large as the United States. But when an Antarctic ice shelf the size of Manhattan collapsed in less than a month in 2002, it shocked scientists and raised the alarming possibility that Antarctica may be headed for a meltdown. Even a 10 percent loss of Antarctica's ice would cause catastrophic flooding of coastal cities unlike any seen before in human history. What are the chances of a widespread melt? "Secrets Beneath the Ice" explores whether Antarctica's climate past can offer clues to what may happen. NOVA follows a state- of-the-art expedition that is drilling three-quarters of a mile into the Antarctic seafloor. The drill is recovering rock cores that reveal intimate details of climate and fauna from a time in the distant past when the Earth was just a few degrees warmer than it is today. As researchers grapple with the harshest conditions on the planet, they discover astonishing new clues about Antarctica's past—clues that carry ominous implications for coastal cities around the globe. Secureteam10 is your source for reporting the best in new UFO sighting news, info on the government cover-up, and the strange activity happening on and off of our planet. There seems to a 500 mile wide gradational anomaly underneath the Antarctica Ice that basically appear to be due to a celestial impact. This is thought to be warming the bottom of the Ice, perhaps making it livable. There are some strange events happening in Antarctica. Images taken by scientists from NASA's Icebridge mission shows a rift in Larsen C, an ice shelf off the Antarctic Peninsula. The rift is 75 miles long, 300 feet wide and one third mile deep. The crack is expected to spread across the entire ice shelf causing a massive separation. .
Organism 46b is a species of giant octopus, but with 14 arms rather than eight. It shares traits of its nearest known relative, "vitreledonella richardi", the glass octopus. But 46b can do one thing that its smaller cousin cannot. It can paralyze from a distance of 150 feet because its venom is contained in the sac that is normally used for expelling ink. Expedition member Alexis Vindogradov, the radio operator, was dispatched in this way, and the radio was lost. In this fascinating documentary we get to see how octopuses behave in the wild too. Off the coast of Vancouver Island, underwater divers are watched by a huge octopus - a ghost like creature that lurks until it feels it's safe to emerge and be seen. It's an eerie encounter. In one experiment we see an octopus wrap its tentacles around a screw-top jar that has a crab inside it. In slow but determined fashion, the octopus successfully opens the jar to get to its prey. The jar is unlike anything it would encounter in the wild - the octopus has used cognitive reasoning, not instinct, to catch its well-deserved lunch. Watch as an octopus slips out of its tank and slithers casually across a concrete floor. Is it making a break for freedom? Not at all. It knows that its prey is just a short distance away in another tank. They give up everything, including their life, for their eggs. *This raises the question 'Could all Octopus/Squid creatures found on Earth really have been transported here by the Cenos ET aliens' given that The Hands ET aliens are 'rejects' of an octopus like life-form living in the ocean's of their home world and that the 'Beau Ideal' of independently mobile ensouled species more closely resembles a quadripedal intelligent squid than a bipedal simian (Chelsea Quinn Yarbro; MICHAEL'S PEOPLE (MP); Berkley Books, New York, July 1988 pg. 204). A truly shocking and astonishing video on extremely strange events in the Antarctic. A naval officer tells us what he remembers, including seeing a huge opening in the ice in a no-fly area they were crossing with a medical emergency on board. Antarctica Pictures Are Revealing What Is Under The Ice! What has the military found in Antarctica? California drought to reduce food production in the USA. The wilder minds of the internet have made a series of sensational claims about the South Pole, suggesting it's home to alien bases and even a lost human civilization. You won't find this theory in any science books, but a quick Google search will throw up screeds of claims that Atlantis is frozen in Antarctic ice. Some suggest the Nazis built secret bases in Antarctica during World War II, which were designed to be used by flying saucers. A few years ago a defecting Russian scientist surfaced with a mind- bending account of what REALLY occurred when he and his colleagues went missing for five days in a mysterious lake 12,366 feet beneath the Antarctic ice. Of course there is also Admiral Byrd's Operation Highjump, it has been suggested he actually discovered entrances to a vast Hollow Earth. Watch this documentary and find out the truth behind the mysteries. 26:40 Organism 46b a giant squid like creature that attack. Note: Birdman and Cenos being. An elevator was installed to take Russian divers to an under-ice warm water lake. They found organism 46b which is a giant octopus like creature with 14 arms that could simulate a diver then paralyze victims with venom and attack other divers and tear them apart. Q: (T) Do any of the tunnels lead to Antarctica? Q: (T) Is there any way of getting to Antarctica through the tunnel systems even if you have to come to the surface occasionally? Q: (L) Are humans ever taken into these tunnels or places underground... (T) Against their will? 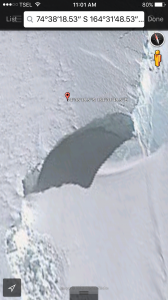 Q: (T) Is there some kind of underground base in Antarctica? Q: (T) Were any of those bases underground in Antarctica built by the Germans during World War II? Q: (L) Lakeland is in the center of the state. (T) Where does it go? Are these side tunnels to a main tunnel that runs along the East coast? Q: (T) So, it is like a subway or bus line? Is there a tunnel farther South of here? Q: (T) How far does the farthest South tunnel go? Is one of the worlds greatest secrets about to be uncovered? There is a huge magnetic anomaly in Antarctica, on the east coast of lake Vostok's shoreline. This is what you would see if you found the ruins of an ancient, buried city! Such a discovery would be absolutely dazzling, sending ripples through our world. 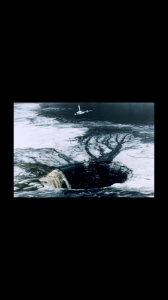 And there were even stranger stories suddenly coming from the "bottom of the world" in this same time frame, such as witnesses claiming a huge UFO has been discovered under the ice. There are of course the sudden and mysterious evacuations that no one has an explanation for. This is not a natural anomaly, but generated by some unknown technology deep under the icecap–it may reveal the physics of time and could potentially allow control of the past, and by implication the future.The mind boggles as to what is really going on. Of course it's gonna be some boring rock phenomenon. It's never aliens. Until it is. Scientists with the the British Antarctic Survey (BAS) found areas of the Antarctic Ice Sheet were melting unexpectedly quickly and used radar to peer through three kilometers of ice to determine what might be causing the melting. What the researchers discovered is an area twice the size of London which appears to be melting from the bottom up. 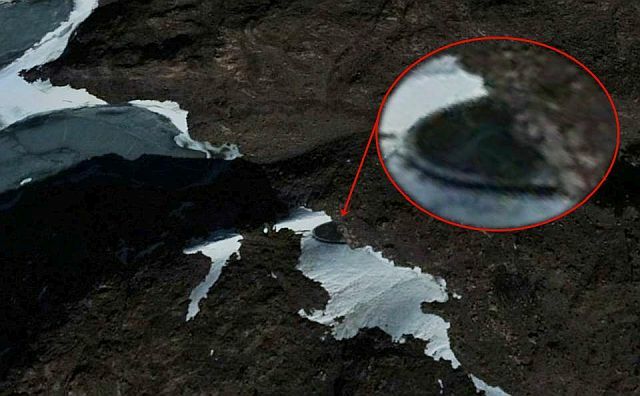 Another image of a 'dome' in Antarctica sparked claims there was once a civilisation living in the frozen continent. The picture, which was said to be from Google Earth, showed an oval-shaped structure that is believed be 400 foot (121 metres) across. Remote viewing is a controlled and trainable mental process involving psi (or psychic ability). Remote-viewing procedures were originally developed in laboratories funded by the United States military and intelligence services and used for espionage purposes. The scientific understanding of the remote-viewing phenomenon has greatly advanced in recent years, and as a result the process of remote viewing can now be reliably demonstrated in both laboratory and operational settings. Antarctica. Pyrmids under the ice 20 times bigger than Egypt's. Rivers of warm waters, large voids under the ice. "Two timelines are converging now and when that convergence is finished we will have full disclosure. This is why all of the major world leaders went to Antarctica, and continue to arrive every day. The ancient lost city is already in view. This is what I have been calling ‘The Base’ in earlier transmissions and discussions. Everything is there and the elites have been arriving by their special craft not only to seek protection from being arrested, but also to try and make a deal with the Galactics who are in control of the entire area now. There are those in the top ranks of the elite who are in "The City" now and attempting to make a deal to get into the healing chambers. Kissinger included." VISIT TO ANTARCTICA CONFIRMS DISCOVERY OF FLASH FROZEN ALIEN CIVILIZATION - Jan 26, 2017 In early January 2017, secret space program whistleblower Corey Goode says he was taken to Antarctica to witness the first scientific excavations of ruins from an ancient flash frozen civilization buried under two miles of ice. With Antarctica being so prominent in the news lately, Brett discusses a remote viewing project that he participated on, which focused on describing the most significant relics found on the continent. What he discovered might surprise you. Antarctica was once Atlantis. An antediluvian island continent paradise from where evil nephilim overlords ruled the entire Earth with great ruthlessness using occult knowledge that included things like black magick & super advanced technology taught to them by their fathers - the watchers that fell in the days of Jared [see 1 Enoch 9:6-9]. A growing number of researchers contend that there is alien technology beneath the ice in Antarcita. I recently interviewed Ted Broer on the phenomenon. He asserts that there is alien technology beneath the ice in the lonliest continent on the planet. Something is happening, and the Antarctic is critical. It’s my contention that because of the advanced technology of the Third Reich . . . that they went under the ice, so to speak, and came into contact with beings, sentient beings that Wernher von Braun and others have made reference to many times before they passed away. So, all this is a matter of record. When you put all the records together, it points to this: There is some entity or group of entities that are thinking and have advanced technology and, basically, give orders to the religious and political leaders of our day. Antarctica: 300' diameter saucer, helo pads, air strips that could land a 747, Lots of 18 wheeler semi's and other trucks all over the place, multi billions if not trillions of dollars worth of stuff down there now. CLIF HIGH’S WEB BOT PREDICTS FEBRUARY 17, 2017 ! FINANCIAL CRISIS 2017? - Feb 13, 2017 Censorship run by Google suppressing Alternative media investigating such things as the elites, gold and silver, conspiracy theories and other woo woo subjects. Take the world into the SiFi world: Religion under factual assault, prove biblical distortion of history, greatest revolution in over 7,000 years will be overtaking humanity in the next decade. The religious structures will die within about 4 years. Tithe revenue diminish to about 10% current levels. Ice Age begin about 2025 to 2017 resulting in the great ten year long Diaspora of people moving from the northern hemisphere. Ocean currents changing, Ocean levels decreasing, glaciers form, ice in such areas even as the tropics and flash freezing as videos over 2017 to 2018 show the plasma descends from space even down to sea level. These flash freezes will bring down aircraft along with tons of ice, pipes in buildings and cannels, and amounts of broken glass caused by building distortions. A cruise ship will be involved in one of these flash freezes before mid year 2018. Whole rain storms will be frozen in place with ice columns forming. Frozen beaches with ice extending out into the oceans for miles. Authorless have been colluding to obscure the data relative to the impending Ice Age. Antarctica related events occur with working ET alien technology and Australia will heavily participate in the Antarctica wealth boom. Global dollar depression over 2017. india pop in revolt. Antarctica: Source of wealth and precious technologies. Source of global wide technology boom that will eventually solve our energy problem. Power elite formed a wall to hold their position, and it was supported by the legacy media to suppress things as pedophilia, etc. While tales of a secret base in Antarctica may appear implausible to some, the new revelations of 60-70 degree temperature water, magnetic anomalies suggesting the possibility of a hidden city or base and the obvious back out taking place concerning current events at the pole, the idea of a secret base is no longer so far fetched. Could Neu Schwabenland have been a permanently manned German base at that time? The brackish water of the warm (30 degrees) lakes virtually confirmed that all had an outlet to the sea and would thus have been a haven for U-boats. The two ice-free mountain ranges in Neu Schwabenland presented no worse an underground tunneling project for Organization Todt than anything they had encountered and overcome in Norway. Pope Francis is reportedly about to disclose the existence of extraterrestrial life. Whether or not this claim is true, two things are sure: We're supposed to believe that ETs exist, and this pope is committed to transforming the way all of us live. 22:00 - Major shift in human consciousness. Clif High: Fulford and Wilcock useful idiots being lead around, but they do sense the 'wave of change 'engulfing our society. Trust but verify, and if you cannot verify, you cannot trust. This is a two-and-a-half-hour excerpt from David’s Friday and Saturday presentations at the Conscious Life Expo 2017. In their original form they run six hours. David also spoke for three hours on Monday, presenting an incredible new model of the Cosmos based on sacred geometry - and proving that the Sun is going to release a DNA-transforming burst of energy in our near future. Are we about to hear that ancient ruins have been found in Antarctica? Is there an Alliance working to defeat the greatest threat humanity has ever faced on earth? Could the Antarctic Atlantis be part of a full or partial disclosure? Join David Wilcock on a thrill ride of discovery, beginning with Part One where he presents data on the Secret Space Program and shares the stage with legendary insider Corey Goode. This is the best public summary David and Corey have done of this amazing story that has captivated the UFO community. Part Two begins at the 53-minute mark, with David connecting the dots between intel from multiple insiders to arrive at a stunning conclusion -- that we are on the verge of major new releases of information that will transform everything we thought we knew about life on earth. 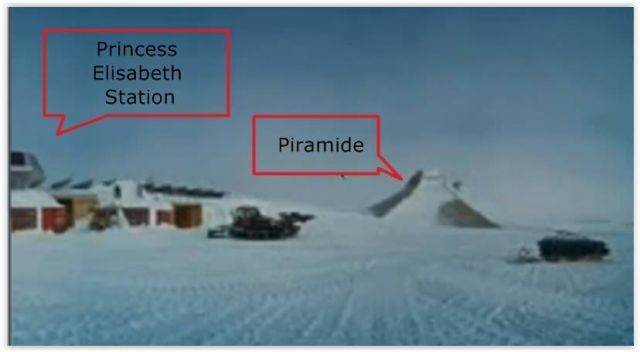 A civilization of "Pre-Adamite" giants with elongated skulls appears to have crash-landed on a continent we now call Antarctica some 55,000 years ago. Various groups we collectively call the Alliance are working to defeat the Cabal / Illuminati / New World Order, thus making the headlines crazier by the day. If the Alliance succeeds, their plan is now to begin the disclosure process by telling us there was a civilization in Antarctica. We are already seeing multiple, compelling hints of this in corporate media. 44:12 Cenos and Birdman ET aliens. See Figure 6. 1:00:49 Blue Birdman like in The Law Of One that stands on its 3 toes. 1:11:03 Book Of Enoch found 1773 in Ethiopia and Translated. Enoch specifies 200 watchers. 1:46:41 Normal human holding an Umbrella for a very tall human being. 1:53:15 Anshar egg shaped craft. 1:54:10 Excavating a pyramid or obelisk with steam blowers. 1:55:40 15,000 human bodies casualties after the alliance had gone after a base. How do we get rid of them? 1:56:50 Canadian marines were called in and the above were the result of half a trailer of ammunition being expended. 1:57:40 Dump the dead human bodies at sea. 1:58:20 Cabal almost completely gone. 1:58:50 Cabal made the drought in CA and now it is raining. 2:00:40 Normal underground city can hold 40 to 45 thousand people. 2:01:00 Sun putting out more Xrays and it is killing flight crews. 2:02:40 All aircraft carries were brought back to port to put exotic new weapons on them. 2:04:10 Aircraft carriers armed with laser solitons. 2:13:50 Giant Aliens, some in stasis chambers. 2:18:20 The UFOs take off in the front and return in the back. 2:18:50 One of the craft has 35 to 40 thousand alien beings still living in it. Everyone that went down wanted to see this, and they fear us because they are so war like. 2:20:10 There are three mother ships like this and the small UFO can go out into the solar system, but no further. 2:24:10 They have caves, vegetation and light from light emitting bacteria. 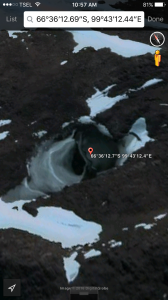 2:25:40 Image of Core standing with Carrie in on of these Antarctica underground places. 2:27:20 We are on the threshold of an amazing disclosure of knowledge, as if Jusus was here. 2:28:16 Like a closing prayer. Good analysis showing that Antarctica is described in the Book Of Enoch (by the seven peaks of Mt. Wilson and proposing that there still are 'Fallen Angels' or aliens living there. Copper tipped weapons kill them. 35:00 - 41:00. 2.5 mile long submersible craft. Brian’s high strangeness experiences flying cargo and rescue in Antarctica were in the 1983 to 1997 time period and included several observations of aerial silver discs darting around over the Transantarctic Mountains. He and his crew also saw ancient ruins and a big hole in the ice only about five to ten miles from the geographic South Pole (pink circle on map) that was supposed to be a No Fly Zone. But during an emergency medevac situation, they entered the No Fly Zone and saw what they were not supposed to see: an alleged entrance to a human and E. T. science research base created under the ice. Then at a camp near Marie Byrd Land, some dozen scientists disappeared for two weeks and when they re- appeared, Brian’s flight crew got the assignment to pick them up. Brian says they would not talk and "their faces looked scared." That is fact. It is undeniable. But... the part of the story that is seldom told, at least in "official" circles, is that Byrd and his forces encountered heavy resistance to their Antarctic venture from "flying saucers" and had to call off the invasion. World leaders looking to extraterrestrials for wisdom. World leaders asking advice for what is good for entire planet. Given many ideas how to create more stable worldwide atmosphere. Financial collapse has backed off because everyone is wanting to be more secure. All eyes on united states. World fears choices of united states. Where there is fear there is always criticism. Do not be afraid of your opinion, for it does matter. Make sure your opinion does not discourage another. Do not tear down what is happening with others. You do not have to cast judgement to have an opinion. Governments understanding ETs are not meddlers, rather advisers. There will be talks in June. ETs will always be with us, and always encourage us to be who we are. ETs cannot protect us from ourselves, maybe from someone else. ET agenda is to be themselves and to help in a way that is not manipulative. Trump joined meetings but could not stay. Trump found out about aliens with briefing with Obama. Trump got greater fear because he will have to deal with ETs in a very personal way. Trump is not in favour of all Israel’s thought processes. Large Ships to appear in 12 locations like in the movie ARRIVAL. This to happen in the near future. Israel and Trump are not in tune with one another. Mass Evacuation Of Antarctica Happening Just Now. All Civilians and Scientists Being Flown Out. Special Operations And Military Moving In. This astonishing report was published at godlikeproductions. Can’t divulge much but I can say there is an instant order to move a material ton of some badass state of the art gear down to Antarctica. And also found out all civilians are getting evacuated as soon as possible. There is also a flare up of activity in Antarctica. Top US and Russian generals Joseph Dunford and Valery Gerasimov met on February 16th and "launched a combined US-Russian force steaming toward Antarctica after the cabal set off nuke," according to Pentagon sources. This "nuke" is apparently the source of radiation being detected in various parts of the atmosphere and so there will be serious retaliation, other Pentagon sources said.